It's no secret that going to the movies is expensive -- that's why you always: a) get Kramer to make you a bootleg copy of the movie, or, b) if you do actually go to the theater, smuggle in a bag of Raisinets. But how did it come to this? 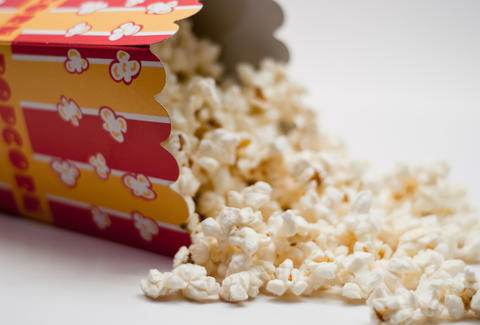 Why is a small popcorn somewhere around $7 (if you're lucky)? Turns out it can all be traced back to a series of Supreme Court cases that regulate the relationship between theaters and studios, and basically force theaters to overcharge you for those Junior Mints. According to Today I Found Out, back in the days of the studio system, studios directly or indirectly owned theaters and could distribute movies wherever they chose and charge whatever they wanted. Antitrust lawsuits brought this down over time, and in 1948, the Supreme Court finally decided that theaters and studios should split the profits of the movies they show and make. But it's not exactly down the middle. Essentially, theaters make as little as 20-30% of the total revenue from the movies they show, with the rest going to the studios, due to uneven financial negotiations (studios get around 90% of the revenue from a movie in its first week of release, which diminishes over subsequent weeks with more money going to the theaters). This causes cinemas to seek money from other areas, and concessions are the logical choice -- the studios can't touch them, and they can mark them up to the point where they're actually profitable. This price-gouging actually keeps theaters in business, believe it or not, since they don't make a lot from the movies themselves. So when you see some $5 Junior Mints behind the counter while you're in line for Interstellar, know that there's a reason behind the price. And that maybe someone should complain to Ruth Bader Ginsburg about it. Adam Lapetina is a Food/Drink staff writer for Thrillist, and can't see a movie without gummy sharks. Read his musings at @adamlapetina.